The Sachsenring circuit in Germany played host to the 8th round of the 2013 MotoGP championship this past weekend. The German circuit, which was is one of the shortest tracks on the calendar, saw Repsol Honda rookie and superstar Marc Marquez take his second victory of the season and take the lead inthe standings, as both title rivals, Dani Pedrosa and reigning World champion Jorge Lorenzo, were both ruled out of the proceedings, after sustaining injuries during the practice sessions. Lorenzo had just taken a highly impressive fifth place at the Assen GP, just 36 hours after undergoing collarbone surgery, and in Germany, the Yamaha factory rider was still not 100% fit, but all the same he dominated the first practice on Friday morning, but disaster struck in the second session. On a hot lap at the start of practice, Lorenzo highsided and as he crashed hard on the asphalt, he hit his left shoulder, bending the titanium plate that had been inserted surgically just two weeks before. This time there would be no heroic repeat of Assen for Lorenzo, as he returned to Spain to undergo a second and more complicated operation to repair the damage, with the rider later posting on Twitter, that he would be sitting out the upcoming weekend’s Laguna Seca round – even if his squad will be in California – hoping that he’ll change his mind. Standings leader Dani Pedrosa also suffered a similar fate, but on Saturday morning. Crashing out after a viscious highside, Pedrosa injured his left collarbone sustaining a small fracture, but it wouldn’t be the fracture that would rule him out of the race, but a series of vasovagal episodes. Suffering from low blood pressure, dizziness and blurred vision - he also took a huge knock to the head in the crash – forced the doctors to declare him unfit just hours before Sunday's race. 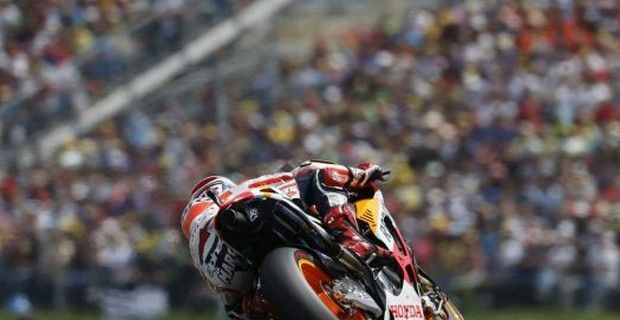 With the two title rivals out of action, Marquez started in pole position for the third time this year – and when the lights went out it wasn’t the rookie who got the holeshot, but Assen winner Valentino Rossi. However, the Italian’s lead lasted just a few corners as homeboy Stefan Bradl – to the joy of the more than 85,000 fans at the circuit – rushed to the front. The first few laps were tight as Marquez found himself in fourth, behind not only Bradl and Rossi, but also behind CRT rider Aleix Espargaro, while Britain’s own Cal Crutchlow- second on the starting grid - and riding battered and bruised with numerous cuts and abrasions picked up in two crashes – fell back to sixth. As Marquez started to make his way past Espargaro and then Rossi, he the would take the lead from Bradl on the sixth lap and never relinquish it for the remaining 24 laps and take the victory, even if he did come under pressure during the final laps from an astonishing Crutchlow. The Yamaha satellite rider made his way back up through the field and by lap 10 he was up to third, and after a couple of unsuccessful attempts to pass Rossi – who also had a big moment – got the better of the Italian on lap 16. From that moment on the Briton was a man on a mission, as he charged after Marquez, chipping away at the Spaniard’s lead, but Marquez was completely in control as he cruised across the finish line with a 1.5 second margin. Crutchlow would finish second and take his fourth podium of the season, while Valentino Rossi finished a very distant third, as he struggled with a sliding tire . Stefan Bradl was fourth in his home race and he was followed by Alvaro Bautista, and Crutchlow’s Tech3 team mate and MotoGP rookie Bradley Smith. Ducati’s Andrea Dovizioso salvaged a 7th place after another horrible weekend for the Italian manufacturer, who saw all four riders crash out and bending two frames – and Andrea Iannone dislocating his shoulder – as Dovi ended up battling with Espargaro, while Nicky Hayden and Michele Pirro closed out the top ten.